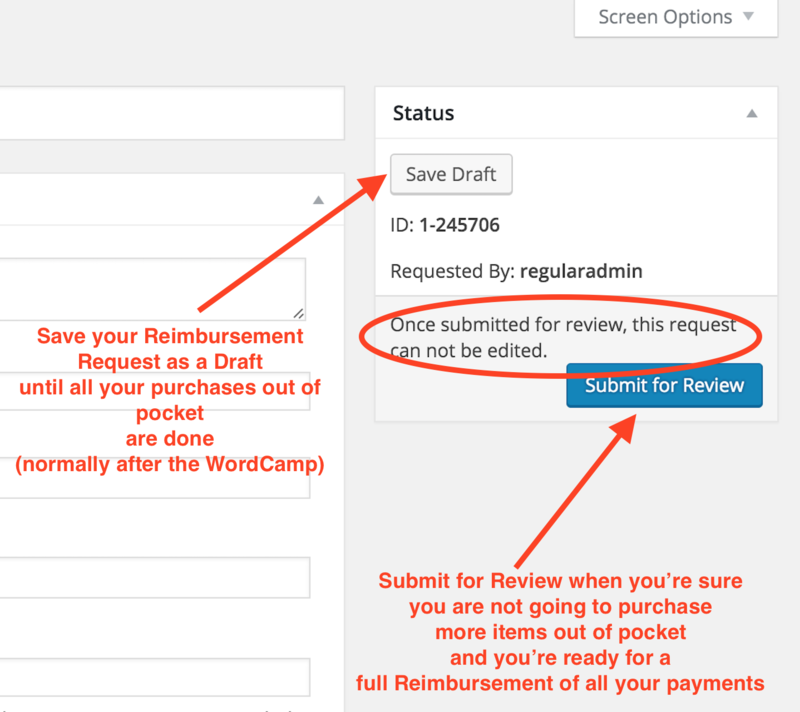 Important Note: Make sure you save your Reimbursement Request as a Draft until you have added all your purchases out of pocket for the WordCamp. We pay fees for each payment transaction, so to minimize overhead expenses, we urge all organizing teams to submit one reimbursement request per out-of-pocket purchaser. 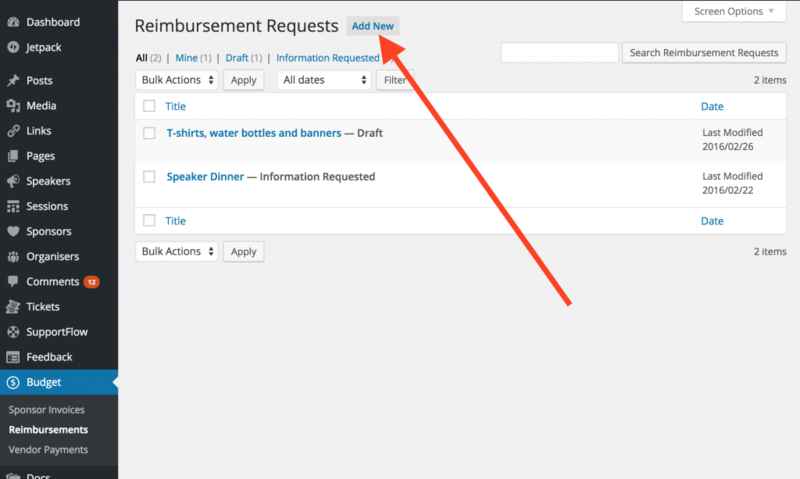 If there were approved expenses for your WordCamp that had to be purchased by an organizer and paid out-of-pocket, and you have a receipt from the vendor, you can request a reimbursement. Let’s walk through submitting a new reimbursement request! Make sure you’ve gathered all of your receipts and payment details before you get started. IMPORTANT: Please black out any sensitive personal information, such as full or partial credit card numbers, on receipts before you upload them to your reimbursement request. Having all your materials ready will help ensure that you get your reimbursement processed quickly. Be sure to start by giving your request a clear title before adding any further information. 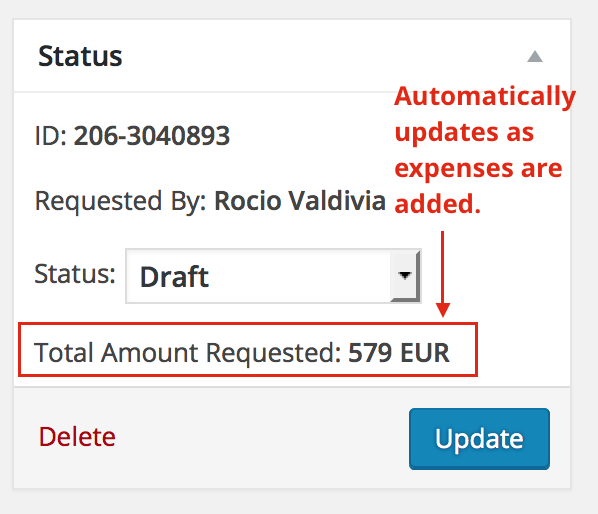 You can leave the Payment Release Date field empty; it’s used to track when the payment was sent from WPCS to the organizer, so it will be filled in later by the deputy who sends the payment. And now payment information. You can request payment by Direct Deposit, Check, or Wire. Direct Deposit (ACH transfer) is the fastest way for us to send money to US bank accounts. If you’re requesting a reimbursement by Direct Deposit, be certain to note whether we are sending the money to a personal or a business account, and don’t forget to fill out all the fields (all them are required). Important Note: Direct Deposits can be sent in USD to US bank accounts only. Check payments to US addresses can take 5 business days, occasionally more. If you’re requesting payment by Check, be certain to note who the check should be made payable to, which in some cases is different from the vendor’s name. 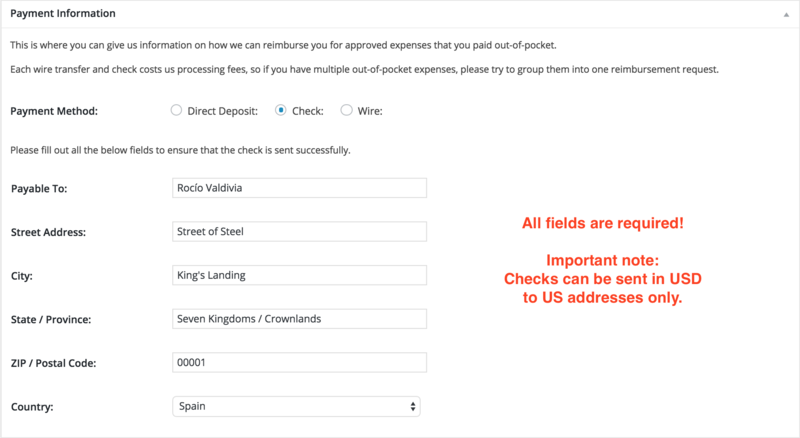 Important Note: Check can be sent in USD to US addresses only. 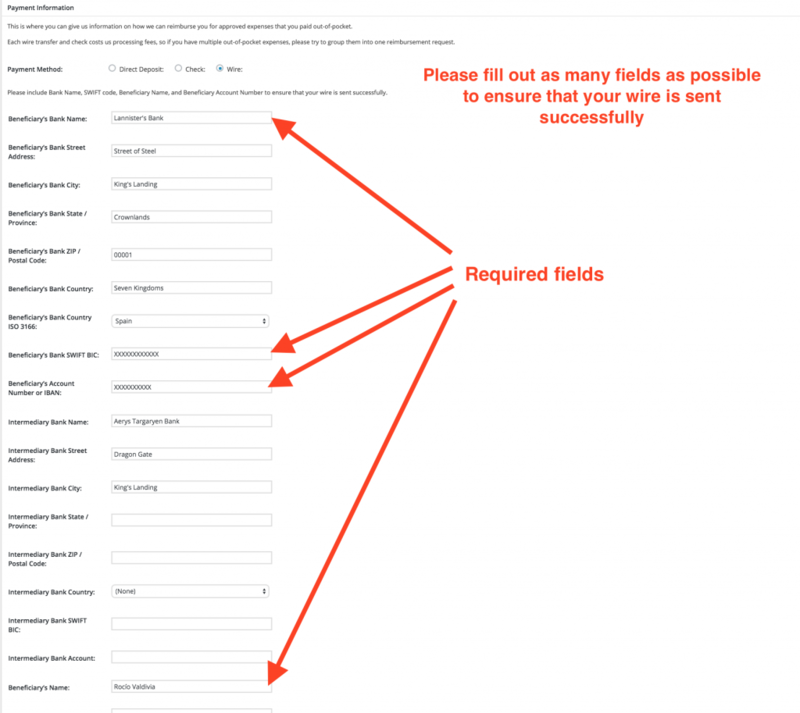 Address fields are not required by all banks, but more information is always better when it comes to wire transfers. Intermediary banks are only required for sending money to certain countries. Here is where you will add the details for the out-of-pocket purchases you had to make for your WordCamp. 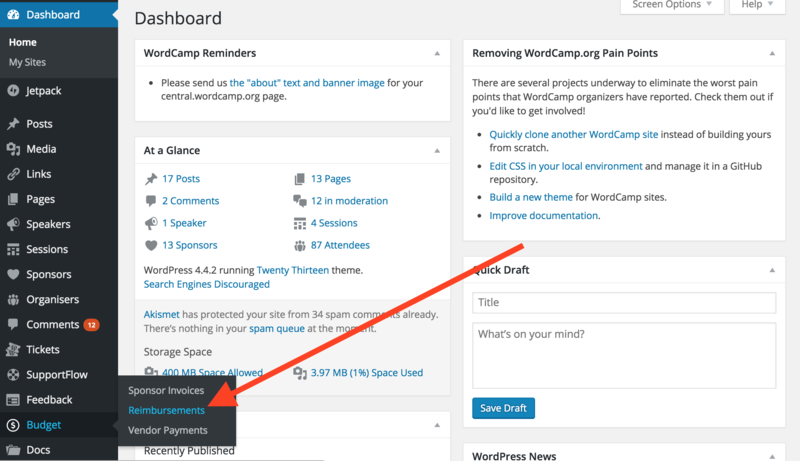 Important note: Remember to save your reimbursement request as a Draft until the WordCamp is finished. Preferably we’ll do just one reimbursement per person. We’re collecting data about whether a vendor is local or online/non-local so we can do a yearly review on whether a vendor is so popular that we might want to negotiate for a program-wide discount. As you add additional expenses, the total on the top right of the post will update automatically. 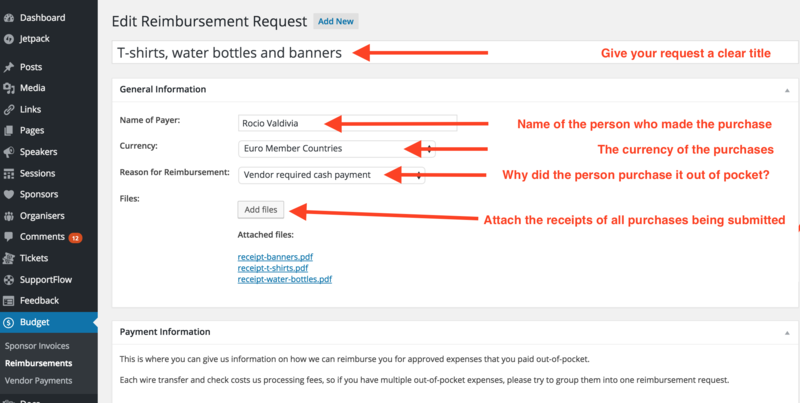 If you have made purchases in multiple currencies, email support@wordcamp.org to ask about the best way to ask for reimbursement in that case. And that’s all! 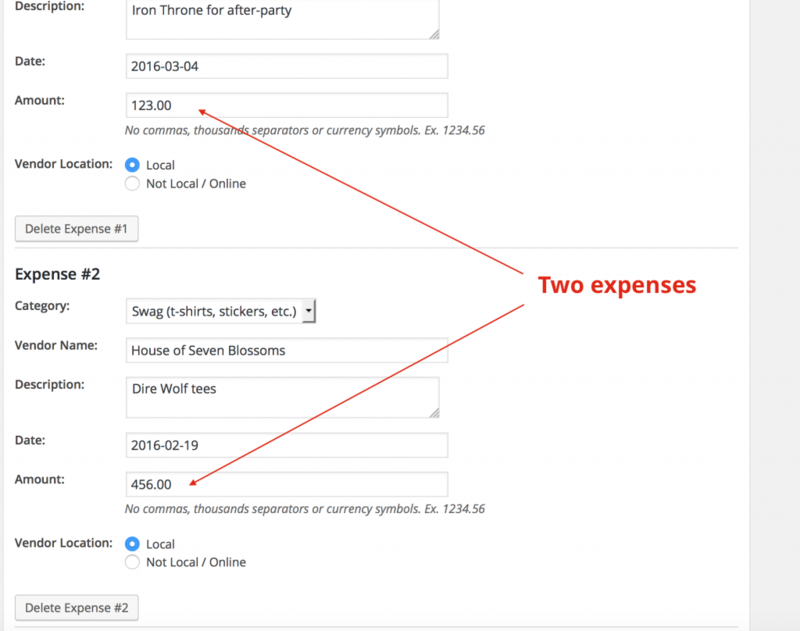 You can add a new expense, save your Reimbursement Request as a Draft and to keep adding your out-of-pocket purchases during the organizing process. Submit your Reimbursement Request when you’re sure you won’t be making any more out-of-pocket purchases.